It was quite difficult to write an appealing name for this noodle store in English, as it doesn’t have one from what I can gather. So, please stay with me as I say century egg… I mean, the Facebook page calls itself Tsunami Gogo, but I couldn’t bring myself to call it that on my post. So, this store specialises in noodles, specifically those lathered with minced meat and chopped up century egg. Still interested? Good! Because, really, it’s quite tasty. In addition, people line up for this most days, so it’s gotta have something about it, right? This is the house special, and actually, it’s probably the nicest dish we have tried, here (we’ve been here a bunch of times, too). Minced pork is mixed in with shallots and chopped up with century egg and a special house sauce. It’s then ladelled on top of noodles and served with a few boiled greens on the side. The sauce itself has an earthy, eggy, rich, fried oniony taste. The noodles are very well cooked, too. The bowls look almost identical, right? However, this bowl has quite a good level of spice running through the sauce ladelled on top, which adds a different element to the dish. It also doesn’t have the small portion of veggies on the side. I prefer this one, as I do enjoy a bit of spice. Want some vegetables with that garlic? I have got used to the volume of garlic I consume now, but it took some getting used to when I first arrived in TW. 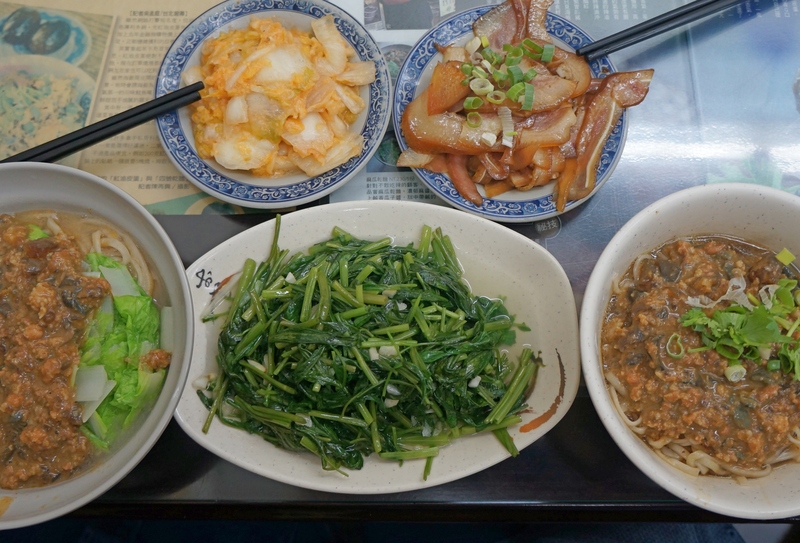 The vegetable here is water spinach, which is deliciously crunchy, earthy and green tasting. It’s one of those that just tastes healthy with every bite. I also picked up a plate of kimchi 泡菜 pào cài (left) and pork head skin 豬頭皮 zhū tóu pí(right). The kimchi here is quite tasty and sour, and the pork head skin is fatty, meaty, chewy, crunchy, and smokey. Both are worth an order, for sure, and they’re around $30/dish.